Bigot, who was probably born in Arles, has just one picture certainly attributed to him, and it survives only as an engraving made towards the end of the seventeenth century. It is a Christ in the Carpenter s Shop. Round this lost painting was grouped a whole series of Caravaggesque pictures, apparently French in origin although derived from Honthorst in colour and general composition. Recent research has proved that this group is not coherent. 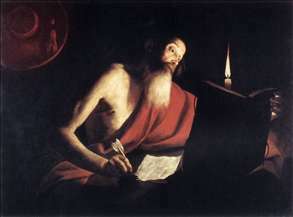 Two large pictures painted for (and still in) the Church of Santa Maria in Aquiro, Rome, are documented as being a certain "Maestro Jacopo", although they were formerly attributed to Bigot. 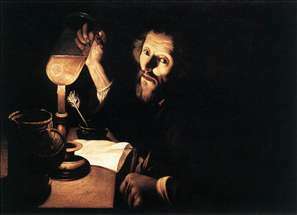 A Doctor Weighing Urine (Ashmolean Museum, Oxford) is an example of the unusual subjects Bigot sometimes favoured. The theory that there were two painters of the same name is borne out by the fact that the other Trophîme Bigot (who was born in Arles in 1579 and also worked there and in Aix-en-Provence) had a totally different style, as a signed picture by him demonstrates. It is inconceivable that the pictures listed under Trophîme Bigot were painted by this second artist, whose Mannerist pictures were produced for churches in and around Arles. 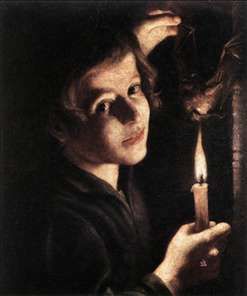 See more details about "Boy Singeing a Bat's Wings"
See more details about "A Doctor Examining Urine"